OK, so it’s a bit of a trick question. On a puzzler's blog, eh? 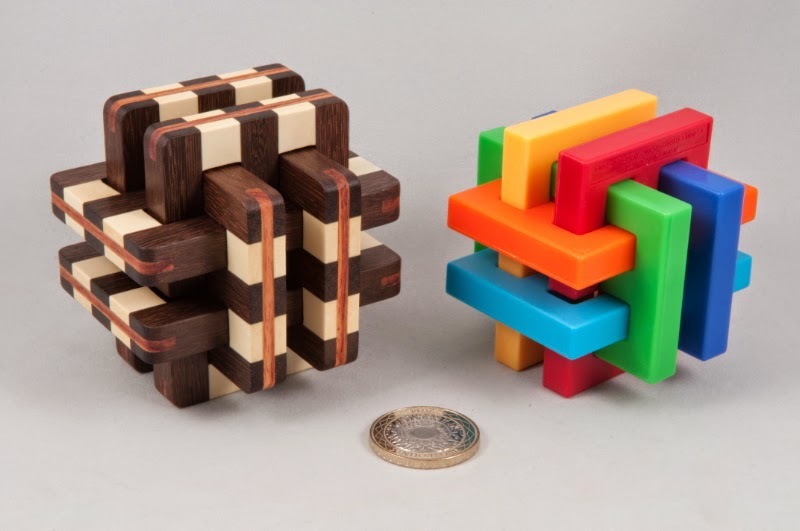 On the right we have Gordian’s Knot from Thinkfun – fine purveyors of puzzles to the mass market … and on the left we have a rather beautiful incarnation of Frans de Vreugd’s Extreme Torture. Thinkfun’s marketing proclaims this to be “the world’s hardest take-a-part puzzle!” and that it takes 69 steps for the full solution. OK – so pretty much everyone already knows all that (Gordian's Knot IS Frans' Extreme Torture! ), so why the long-winded intro? Basically just to give me an opportunity to introduce a really beautiful piece of work from Tom Lensch. 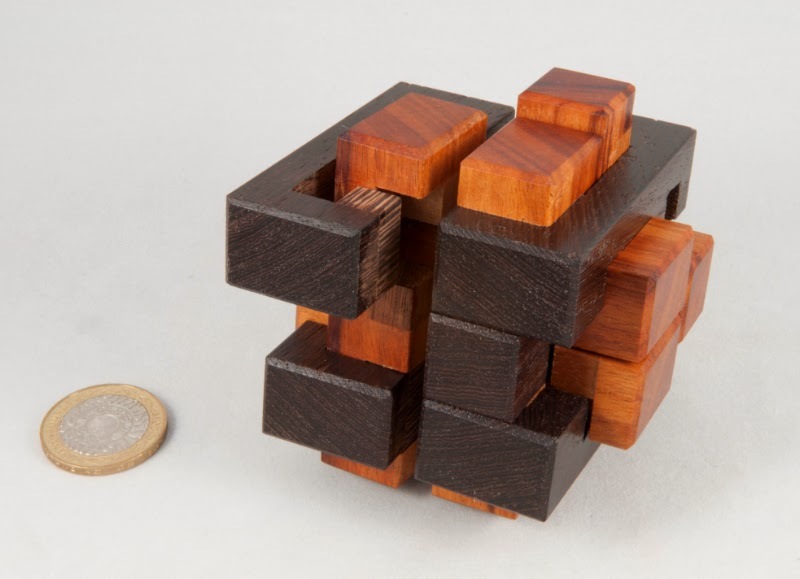 If you surf puzzle-crafters web-sites like I do, you’ll have seen a gorgeous version of Torture (Frans’ forerunner of Extreme Torture that requires a mere 29 moves to disassemble) on Tom Lensch’s site. It’s a stunning puzzle crafted in some beautiful woods whose image has been stuck in my mind for a while now. The fit and finish is classic Tom Lensch – simply perfect and gorgeous to boot! 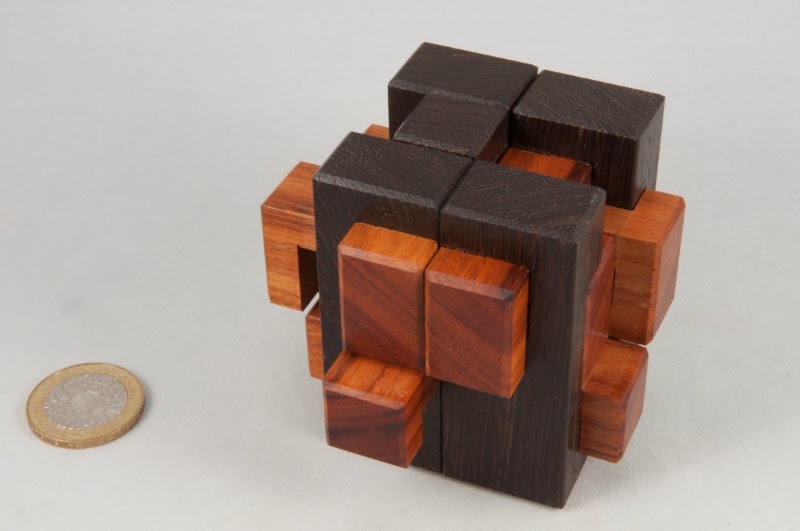 What’s it like as a puzzle? Well, it’s a high level 6 board burr… which means that disassembly is just-about within my reach … and assembly is well beyond it – especially at 28 moves to release the first piece, and a further 21 for the next one … with several multi-piece moves and a lot of positioning before you can do “useful things” along the way… it’ll provide anyone with a decent challenge! The Thinkfun version is super-colourful, totally stable with regards humidity changes (are you listening over there in Hong Kong?) and comes with a handy spiral-bound solution booklet to walk you through the solution in either direction – a really neat little touch! Yip, you read that right – it says MPP Burr… what the heck is that, I hear you ask, well let me tell you a little story. Turned out it was a unique burr designed and made by Stephan Baumegger for the Midlands Puzzle Party – complete with the initials MPP across the three axes – how cool is that! 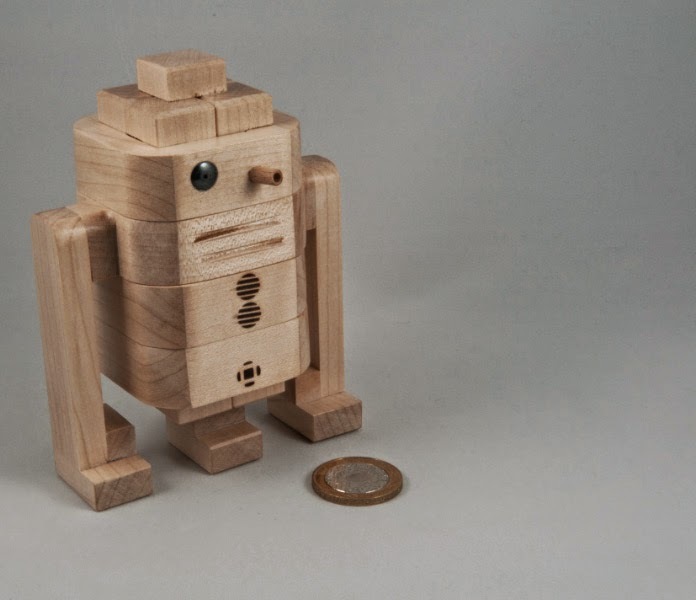 Stephan has been experimenting with some unusual shapes of burr for a while now ('Droid anyone?) and more recently had begun playing around with letters – at which point he decided it might be rather fun to surprise the Midlands bunch with a burr in their honour – heaven only knows what we did to deserve that! Having designed it and satisfied himself it would be interesting, he duly knocked up a rather gorgeous copy and dropped it in the post to me on behalf of the Midlands-bunch … which gets me to the start of my little story. Now not only does it look smashing as a puzzle, it’s unique and “ours”! 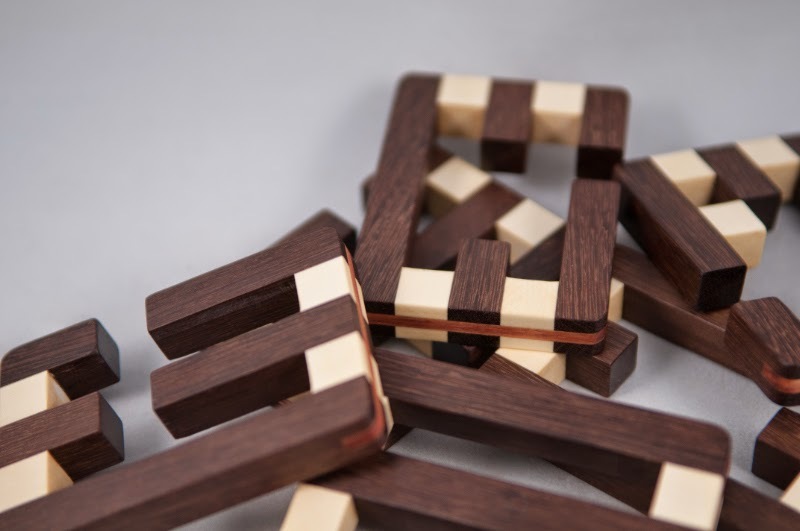 The pieces have some rather interesting shapes – especially the bits that make up the legs of the ‘M’ - some of them wrap around the bits next to them and make for a really interesting solution path. When I started playing with it, it quickly became abundantly clear that this isn’t a simple little burr that happens to form the shapes of our initials – it’s a proper decent puzzle that just happens to have those letters on its faces. There’s a clue in the level – 6.10.3.3… while there are several false starts, it has a unique 34-move solution to fully disassemble it … and given my general rubbishness at burrs, it won't surprise you to hear that reassembly came courtesy of BurrTools. Thank you Stephan – that was a wonderful gesture – I’ve enjoyed it and I suspect that my fellow MPP-ers will as well! Thanks! Finding a copy for sale isn’t all that simple these days – I’ve only seen a single copy pop up on Nick Baxter’s auctions recently, so when I spotted one for sale, I jumped on it … only to discover that there was another version for sale as well, so I ended up getting two versions at the same time – that WAS rather lucky! Tube It In was Wil’s Exchange Puzzle at IPP21 in Tokyo back in 2001. It consists of a set of rectangular steel tubes and bands of various thickness's and diameters which all nest rather neatly inside the largest piece. 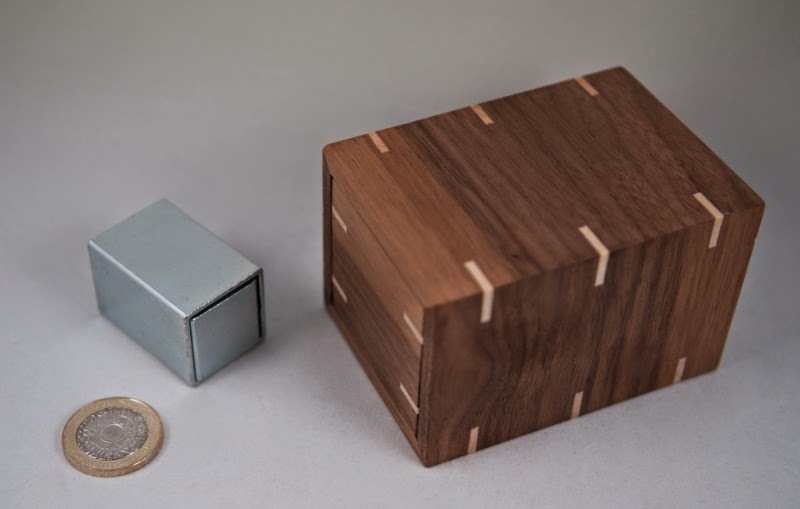 In its solved state, it looks like a small steel box with a drawer in it … open that drawer and you’ll find a bunch more bits inside, in fact, if you aren’t careful you’re likely to end up with a lap-full of little bits of steel … almost all of which are different sizes and shapes. Spread them out on a table and you’ll be amazed to see that there are in fact fourteen separate bits of steel tube making up this tricky little assembly … and only two of the pieces are identical – all of the others are unique …. and somehow they all manage to fit inside the largest piece. The good news is that you can apply some logic to solving it and given the sheer amount of steel that you need to fit into the outermost tube, there isn’t much scope for obfuscation and general leading astray – so you can start at one end of the scale, as it were, and find an efficient way of doing things and you won’t end up wandering down too many blind alleyways. It’s a fun little puzzle and shows that puzzles can come from the simplest of sources if you keep an eye out for things like that – something that Wil is most certainly a past-master at! 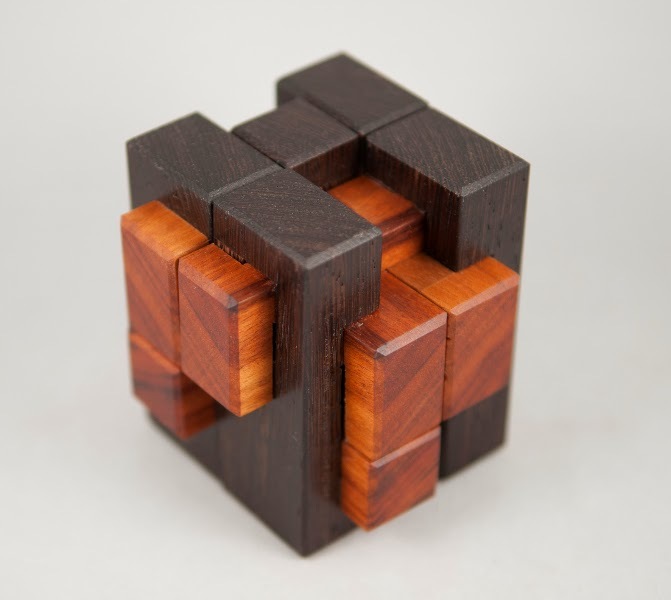 Absolutely faithful to the original design, John created a gorgeous version in wood – my copy is (I’m pretty sure, but I’ve been wrong in trying to identify woods SO MANY times now that I wouldn’t lay any money on it!) 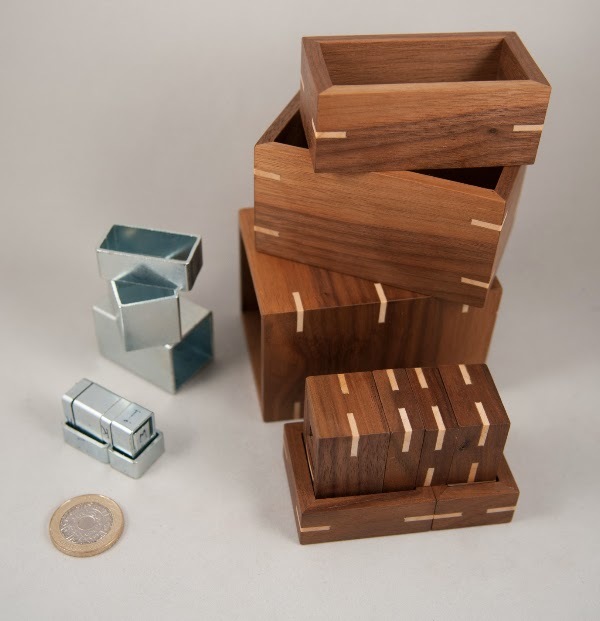 made in walnut with maple slip-feathers and in its solved state it looks to all the world like a reasonably plain puzzle box (albeit one with some lovely slip-feathers!) … in fact, when I first saw it, that’s exactly what I thought it was and paid it no more attention, until someone pointed out what it was … and from then on I wasn’t letting it out of my paws! 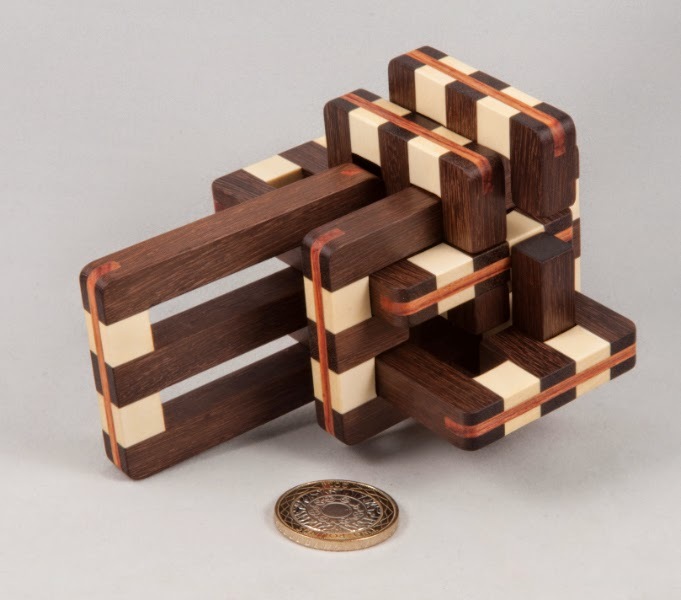 As you might expect from John’s work, each of the layers of this puzzle fits perfectly into the next, and the combinations of tubes all add up just perfectly to the space available … lay out the two versions next to one another and the pieces are instantly recognisable between them and the solution is identical… but the wooden one is simply beautiful! 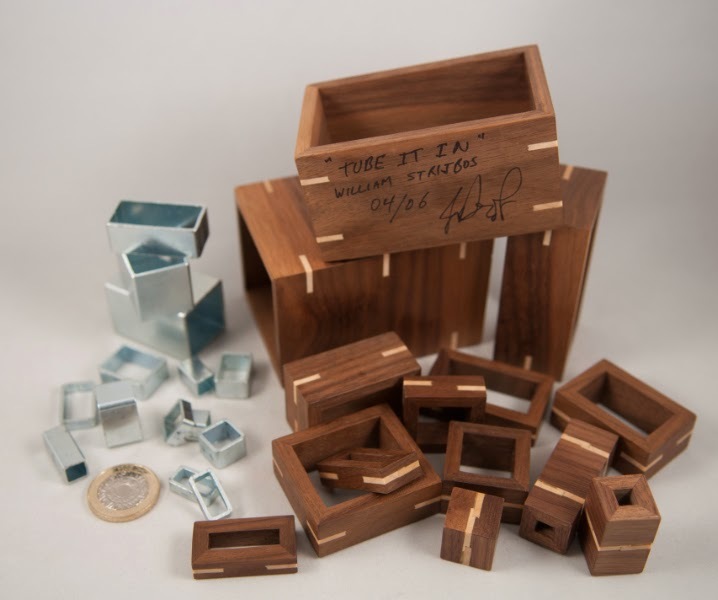 A great pair of puzzles to stumble across – I suspect there aren’t that many wooden copies of Tube It In out there in the wild so I consider myself hugely lucky to have come across them both at the same time.